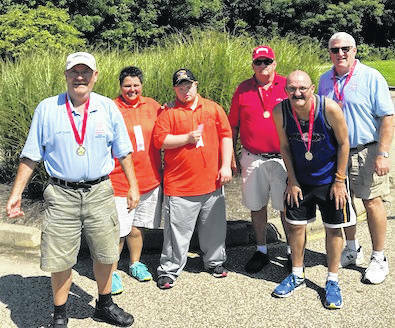 MOUNT GILEAD — Meadow Links Golf Academy in the Northern Cincinnati area hosted the 27th annual Special Olympics State Golf Tournament Sept. 18-19. Morrow County sent three two-person Unified teams to compete. The Unified format is when a Special Olympics golfer teams up with a non-Special Olympics’ golfer, or partner, and they alternate shots throughout play. Michelle Davenport, first year golf partner and Josh Stuber, first year Special Olympics golfer, teamed up to take fourth place in their division, shooting 79. John Higgins and John Kinney, playing their best game of the year, took Gold Medals, shooting 57. The team of Mike Knipp and Jim Trainer also shot their best round of the year, a 46, receiving Silver Medals in their division. Thanks goes to Pine Lakes Golf Club for their many years of support to Morrow County’s Special Olympics golf program, as well as to the Special Olympics athletes and partners that give of their time and talents to make it happen. Those interested in learning more or have questions about Special Olympics may contact Don Barchus at the Morrow County Board of Development Disabilities at 419-947-7045.